We are a French family of 5 people: Serge and Segolene parents, Clementine 25 years old, avocat in law, Marin 23 years old and Angelique 20 years old. We love visiting Paris, museum and centres of interest. We love spending time in French "cafés Parisians" and little restaurants. We bought the presbytery 10 years ago; it was a 'coup de coeur'. Serge saw the advertising in a religious newspaper. He was so excited, we went visiting it and we falled in love with this place. Serge and I thought we could do it as to offer to our 3 children and friends original way of life in this unique place. We have a lot of pleasure spending all our week-ends and holiday taking care of our house and its garden. We love cooking and spending time in the kitchen or in the living room in front of the fireplace. We spend a lot of time surrounding and visiting famous places: Mont Saint Michel, old town of Caen, D Day landing beaching..... Serge does kite surf on the Manche at Franceville beach, Clementine and Angelique are keen of riding horses, bicycle. When friends come to see us, we walk in the countryside, go to Saint Pierre sur Dives old market place on Mondays. Children do 'climbing in trees' in the village. The 5 of ours love sharing moment with others in Olendon. We love resting in this peaceful magic place, we appreciate the garden with all its flowers and swimming pool. Left part: separate WC, shower. Right part: separate WC ground floor, on the first floor: 1 bathroom with bath and WC, en-suite shower to bedroom 4. Are included : sheets (beds are ready at arrival) and bath towels. Bring your own swimming pool towels. There are 2 fireplaces : in kitchen and living room. Additional fees for unlimited wood will be asked in winter. Please park in Church parking or in front of our main wooden door. To drop off your luggage you can park in front of littler red door. You are not allowed to park inside the garden. Bath towels are provided. Bring your own swimming pool towels. TV room. Internet access by wifi. Dining room with large table and view on the swimming pool. Living room with antique fireplace, sofa, armchair, musique with 3 views on the garden (east, south, west). there is a large hob. Nespresso machine or classic coffee maker. You will take advantage of our 3 tables : - large kitchen table for 9-12 persons - 6 persons table close to kitchen for children - dining room table for 13 - outside tables : 8 + 10 Enjoy ! in French and English belonging to the house for the pleasure of all taking advantage of our home. behind kitchen with sofa, 2 tables. Unshared Outside pool table in the garden. Golf et Tennis de Garcelles 18 holes - 5716 meters long - Diversified and technical - A real challenge open to any golf players! unfortunatly, there are too many stairs and no bedroom on ground floor. Our large private pool is unshared, 12x6 meters, heated from 15 april until 15 of september. In the garden, you’ll take advantage of Trampoline, balançoire, piste de pétanque. Notes on accommodation: Unshared Swimming pool in the garden. Not heated from 15 september - 15 April. Maximum temperature 22°C. Pets are not allowed. Outside: Garden all around the presbytery with antique barn. Private heated swimming pool 12 x 6m. The swimming pool safety covering system is Coverseal. Outdoor furniture: table and seats with barbecue, parasol, portico with swings, piste de "pétanque", tennis table and trampoline. An antique "water fontaine" is unsecured and then may be dangerous for young children who don't know how to swim. Picture on request. Utility Room: Washing machine, tumble dryer and iron. Cleaning / Towels / Linen / Maid service: Towels and linen fees are included. Guests are expected to leave the property in a tidy and reasonably clean condition. Handyman gardener on request. This family holiday, with some members coming from as far away at New Zealand, had been planned well in advance and much anticipated. The blocked drains, which we reported to you on the first night we arrived, meant that we could not use the sinks (both upstairs and downstairs), shower and dishwashers in that side of the property. The lack of useable dishwashers meant that valuable time was spent washing up by hand when we should have been relaxing and enjoying our holiday. The inability to use the shower in that half of the property meant that all nine of us had to share a single shower. As I said at the time, this is just not acceptable. While you did make some efforts to try to fix the drains, the problem remained for the entirety of our stay. This major problem also overshadowed some ‘smaller’ issues, which we didn’t even mention at the time, including an oven that would not go above 150degC and that the toilet above the kitchen which smelt badly of urine and clearly hadn’t been cleaned properly. Our family of five (including three boys ages 15, 13, and 9) rented this house for 12 days in June and had a wonderful stay. At the beginning of our trip, the weather was nice and hot, so we were able to enjoy the pool and the large garden. But even when the weather was more Norman, we loved returning to the house after our many day trips as it was comfortable, well provisioned, and conveniently located to a couple of small towns nearby with markets, shops, etc. We'd highly recommend this gorgeous and charming house for large families wishing to visit Normandy and explore its countless attractions. Beautiful home in a lovely setting. We spent a delightful week with extended family. Plenty for everyone from the youngest (aged 10) to the oldest (aged 74). The pool was much enjoyed. Many attractions within reach including William the Conqueror's castle at Falaise, the Bayeux Tapestry, and the beaches of the Normandy landings. A once in a lifetime trip for the older parents from America. The house and garden are huge. The rooms are lovely and big, the beds fantastically comfortable. The local village is very quiet but Potigny - 10 mins drive - has all you need. Falaise is near, the coast easily reachable. We had a fantastic stay in this beautifully kept Presbytery. The house is situated on the edge of a very small village and was very quiet. It was the perfect location to while away a week in France, although could have easily spent 3 or 4 weeks here. The photos on this site do not do it justice. The owners were away on holiday whilst we were there but it was no problem. We had contact using WhatsApp and they also provided a mobile number if required. There was also someone local if we needed anything but we did not have to contact them. We arrived with the extended family (3 couples, 1 adult and 3 children) and the whole house gave us room to enjoy a week together. The pool was great to keep the children entertained when we were at the house and there was enough seating areas so that we could spread out if we wanted to but we did spend a lot of time together in the kitchen which is a wonderful mixture of old and new. Everything was there that you would expect in your own home. There are a number of good restaurants in Falaise (about 5 Km away) and in other towns nearby (although we did not try them). I would recommend La Bonne Raison in Falaise which has superb home cooked food. I would recommend this property to anyone. It was a great place to have a holiday. We really enjoyed our holiday at Olendon. The house is great for a large group with children. The children loved sharing the attic room and the house is full of character and style and is very well equipped. All of the beds are very comfy. The garden is vast and we spent a few days of our holiday not leaving the garden once as the children were so happy there. The swimming pool is beautiful and gets the sun all day and has a very sophisticated and secure safety cover on it to give peace of mind with the children when you are not using the pool. There is a huge trampoline within the grounds as well as swings and a table tennis table. The owner was very helpful when we were preparing for the holiday and during our holiday, answering any questions that we had. The house is located in a small village, 10 minute drive from Falaise. 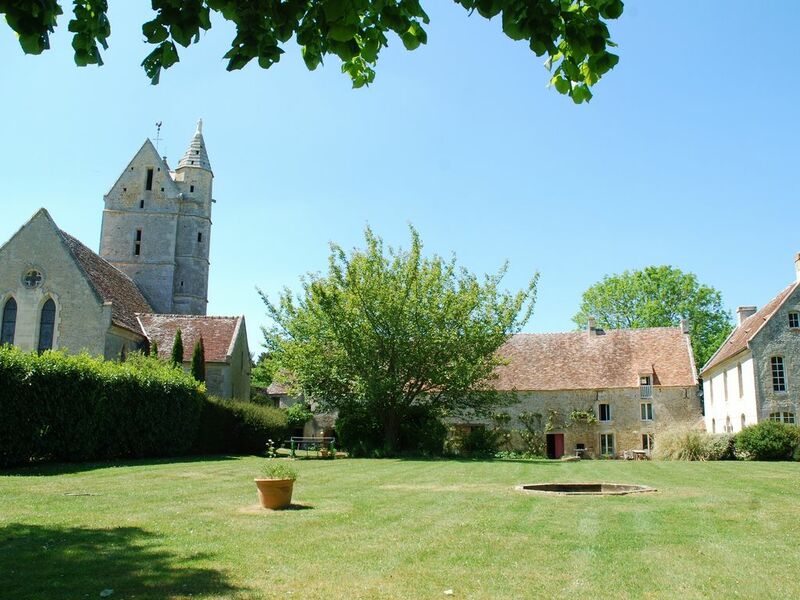 There are no amenities within the village of Olendon but Falaise is a lovely town with all that you would need there in terms of local amenities. The castle in Falaise (William the Conqueror) is a fantastic trip for adults and kids. We would highly recommend this villa to any large group of people. 'climbing in trees' "Parc Aventure Beauregard Sud" in Olendon on the road to Potigny. Vendeuvre Castle with its famous museum of miniature furniture, surprise water gardens and kennels for pets (Vendeuvre - 5km). William the conqueror castle (Falaise - 8km). Karting (St Pierre/dives) Gardens and farm animals in Chateau de Canon (Mezidon-canon town) 15kms. D-Day landing beaches 40 min. Le Mémorial de Caen 25 min. Le Mont Saint Michel. 1 hour 15min. Deauville 55min. Honfleur, Le Haras du Pin (equestrian) 55 min. Ouistreham (Caen) beaches: 30 minutes driving (high road). D-Day beaches (Arromanches, Omaha): 40 minutes drive. Cabourg beaches with its Grand Hotel : 35 minutes drive. Caen-Ouistreham (boat from Porthmouth): 30 minutes. Calais port : 3 hours. Paris: 2 hours. Saint Gatien (Deauville) airport: 50 minutes. Cherbourg port: 1 hour 50 mins. 200m to the village "Olendon". 8km to the town "Falaise"
12km to the town "Saint Pierre Sur dives"
20km to the city "Caen". 35km to the coast (beaches). The local towns of Falaise (8km) and Saint Pierre sur Dives (12km) contain a variety of supermarkets, bakeries, butchers, and general stores including hair dressers and garages. We would recommend the famous XIIIème century market place "Les Halles" in St Pierre/dives every monday before 12am. You can buy cider, calvados, local cheeses (camembert, livarot, pont-lévêque), fruits and vegetable, farm animals (rabbit, chicken, duck) very lovely for children. local sports and activities: climbing in trees 'accrobranches beauregard sud' and paint ball : 800m.